Customize this marble coaster set with pictures celebrating your love. Photo albums may only come out when we're feeling nostalgic, but these coasters? They're always out, letting you re-live happy memories every time you sip. Customize the set with pictures of your engagement, wedding day, honeymoon, or other special moments. 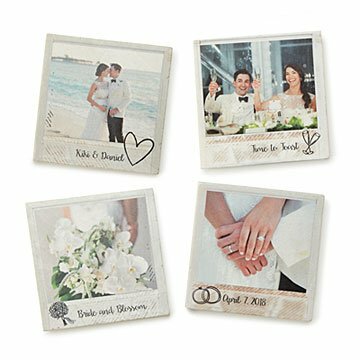 With a touch of instant camera-inspired style, each image is printed onto a square of tumbled marble with cork backing, making them a sweet gift for your spouse, or a thoughtful engagement, wedding, or anniversary gift for a happy couple. Made in Providence, Rhode Island. Will give these to Grandson and Wife this Christmas.